Last week, I joined Katie for their Press Preview Party to celebrate their opening at 585 Sixth Ave. It was quite the lively atmosphere! Within moments of my arrival, I was greeted with a spinach boureka—a Turkish pastry made of phyllo dough and filled with creamy spinach and spices—and a glass of red wine. After finding seats at their long communal tables (made of reclaimed bowling lanes), we went to the assembly line-style counter to order our meals. We both chose to create a bowl. Other options included creating a platter or filling a handmade, tandoori-oven baked plain/whole-wheat pita or laffa bread. Then came the challenging part... choosing what I wanted in that bowl of mine. The options were literally endless. To start, one could opt for a falafal, shawarma, chicken, steak, or taboon base. Their original hummus is always included, though flavored options are available, too. And that's not all. There are 23 impossibilities of Mediterranean-inspired salads of sorts, plus fresh, sliced vegetables. In the end, I decided upon roasted pepper hummus, falafals, Mediterranean rice, Moroccan beans, tabuleh, Spanish eggplant, beet salad, Greek salad, chickpea salad, Israeli salad, and staffed grape leaves. I also tried Katie's pity and harissa. Everything tasted tasty and fresh, and as authentic as 'Fast-casual" food can be. 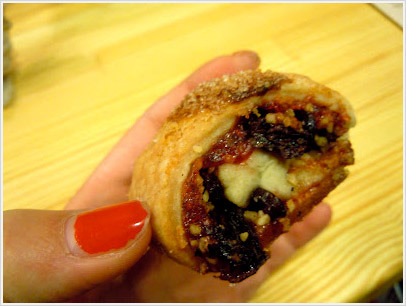 My delicious meal ended wonderfully with rugelach, a traditional Jewish pastry made of a cream cheese dough and filled with dried fruit and nuts. Moral of the story: With it's convenient location, Hummus & Pita Co. is a must for a quick, healthy, and satisfying lunchtime meal. If only I lived/worked closer :).